As we had so many things to do, so many places to go, Nissan had offered us a test-car for our California trip with Mr. Rézmányi. We were to go to West Coast Customs, meet Mad Mike of Pimp My Ride, turn up at Jay Leno's Garage, take a trip to Shelby American in Las Vegas, just to name a few. Our plan was to pick up a GT-R, a proper car for cruising the highways and freeways of California, but it soon turned out that not one was available for such a long period of time. 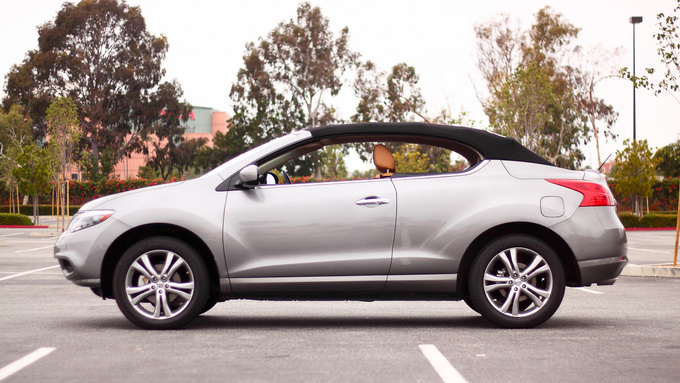 It is the Murano CC we are talking about, the one with two doors and an electric ragtop. This meant that having crammed all our bags and boxes in the trunk (thank God we both played a lot of Tetris at a younger age) the amount of space left was enough for two short sighs. 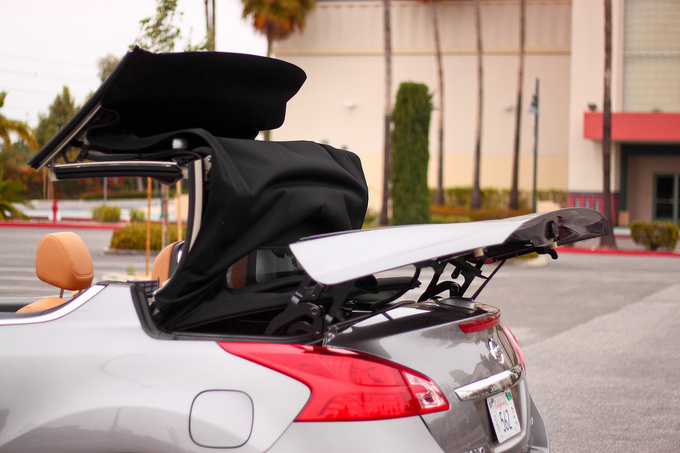 There was no way of opening the top – actually the only thing about the car we were really looking forward to –to enjoy the California sun as the top folds into the trunk. . Neither we, nor the people who had seen the picture of the car thought it was nice. In fact our dear colleagues were laughing in our faces imagining how the two round-headed monkeys (that's us) would look in the car. The brutally honest ones even said they would rather be caught dead than be seen in it in public. Others said free lifetime membership of the Blue Oyster Bar must surely come with the car. Rude! After checking in and unloading all our stuff it was time to press the de-roofing button. With definite moves the heavy mechanics folded the whole canvas topinto the recess under the boot-lid, which was lifted during the process. When driving with the roof folded the space left is enough for the stuff you take on a family weekend - presuming you only take a spare pair of briefs and the absolutely necessary things. Maybe a laptop would fit in, but strictly without the bag. Having more baggage than this the whole tent has to be set up again. But that causes real, physical pain. This is a big car with a big roof, so the mechanics of the roof are big and heavy too, which we couldn't help but notice every time they were in use. 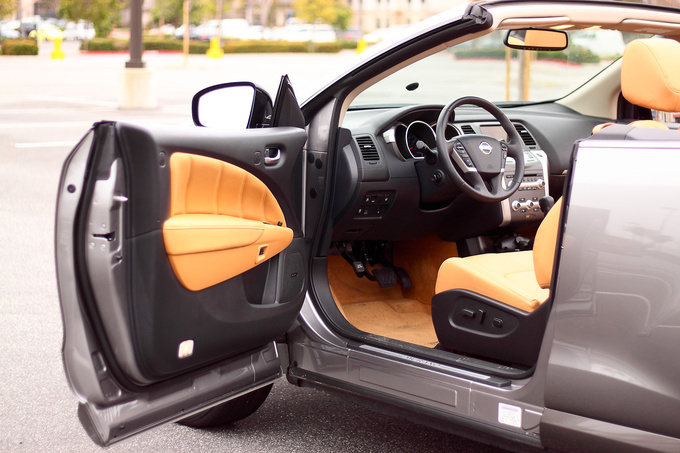 While “buttoning up” the car, the roof stops halfway and the momentum of the heavy first segment jerks the body. Then it falls on the windshield frame, hitting the massive structure right above your head, so hard that it makes your brain vibrate. It's good to know that the roof is built this solid, hopefully the joints will be able to handle the abuse. 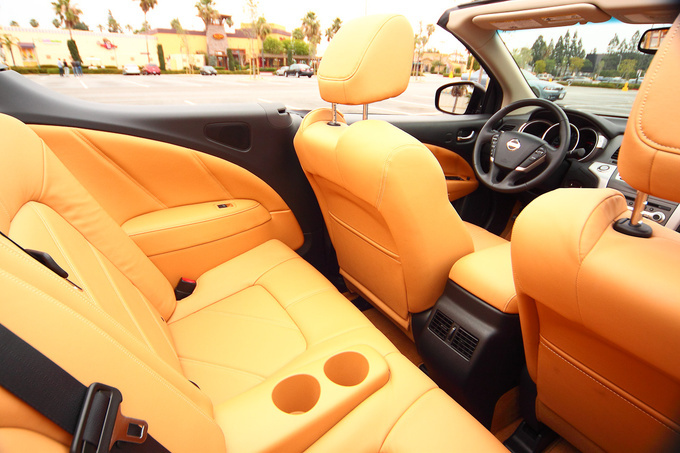 Once the car got undressed, we were ready to enjoy the warm California sun. All we had to do was put the lever in “D”, pump up the volume and start cruising. As we stopped at the red light a few hundred meters away, a car rolled next to us. The passengers were pointing fingers at us. At this point I concluded we really should have worn paper bags on our heads to remain incognito. But there we were, about to swallow remarks about how cute the two of us sweeties look in that adorable bathtub. This is exactly what I did not want to happen. Then the girl in the SUV with the tinted windows started showing us thumbs up, shouting “Cool car!” She said what?? Yes, cool, that's what she said, and all her friends showed thumbs up, too. We had only been cruising for a few minutes and have already bagged a compliment on the car. Of course we wouldn't think much of it if it had only happened once, but the thing is, it happened again and again: bikers, truckers and other drivers kept giving us their seal of approval via sign language. We did receive negative feedback too, there were about three people who did not like the car, but get this: even the girlfriend of a hot rod-builder ran out of the workshop filled with mind-blowing custom cars just to take a closer look. 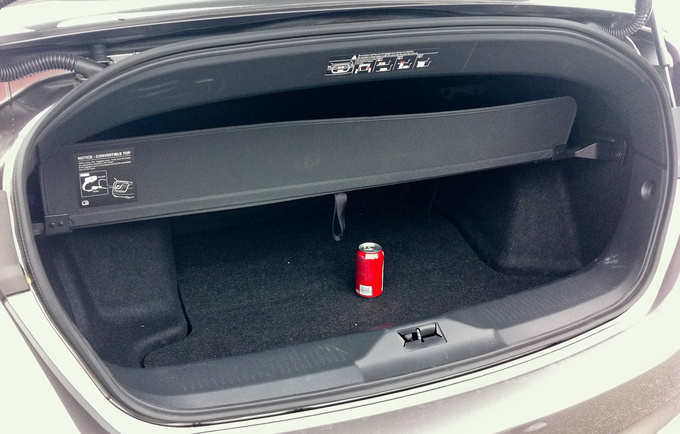 In a few days it became clear that this car was really made with the American taste in mind. No matter what we think the folks really liked it. That said, we did not spot a single Murano CC during our 1600 mile trip. This fact might explain why some people were surprised that it was a Nissan – some thought we were driving a BMW. This car will not be a frequent sight on US streets, as the price tag of USD 48,000 seals its fate as a wealthy mum's drive. The price is high, but you get a lot for the money. It is only available in the highest trim with satellite radio, Bose HiFi, full leather interior, sat nav with voice command, power seats, HID-lights, CVT-transmission and a 3.5-litre V6 with 265 PS. 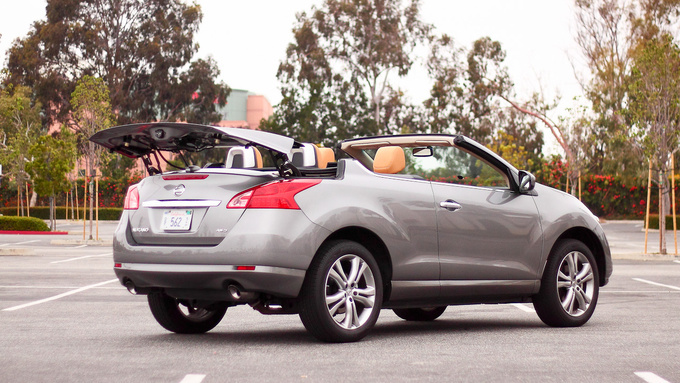 And this is the only convertible SUV on the market at the moment. 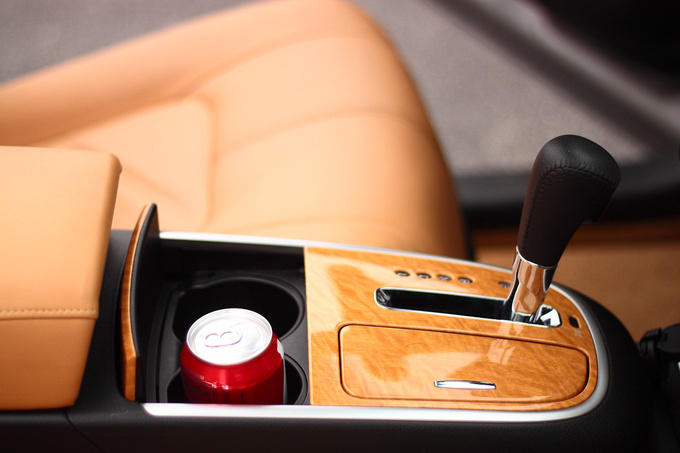 All this makes the car really exclusive. Thanks to the 235/55R20 tires and the four wheel drive, the car accelerates to 100kph in 7.5 seconds without losing the grip. 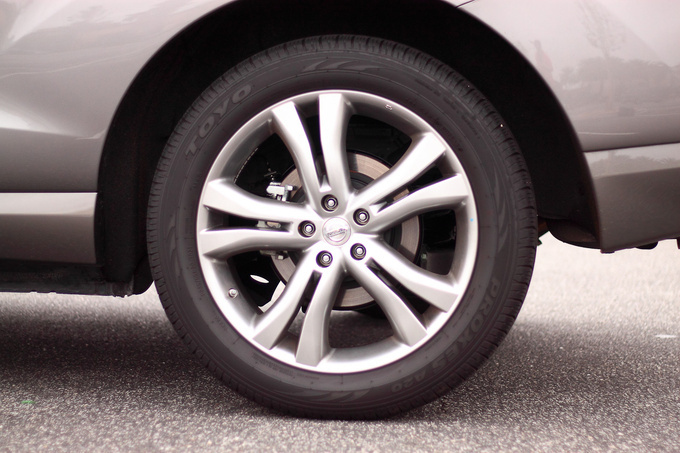 As the Murano CC is a huge whale of a car, it makes those big tires look like ones of a scooter. The sheer mass and size explain why the top speed is limited to 185 kph and why it is absolutely no fun to attack the corners of Mulholland Drive. A car weighing over two tons with a body lacking structural rigidity is not meant to zoom on curvy mountain roads. Raising the roof does help a little, leaving enough headroom, but it limits visibility a lot. Driving with a lowered soft top lets the body rattle on small bumps, but who cares when cruising is such fun. The strangest thing is that I have to think hard to remember what it was like to drive the car. Sitting in the beautiful, light coloured and comfortable leather seat listening to the high quality radio, setting the cruise control to the right speed was all I had to do to get from one part of LA to the other. Jump in, lower the roof, move the steering wheel, step on the accelerator, push the brake pedal, raise the roof, jump out, and that's it. Nothing has happened worth mentioning. Still, this will be one of the best, most memorable cars I have ever driven. Because this was the one that took me to Shelby's and the Nellis AFB in Las Vegas, to Jay Leno's Garage and Big Bob's Burgers in Burbank, to the Toyotafest at the Queen Mary, to the great Cars and Coffee event in Irvine and so many other places. 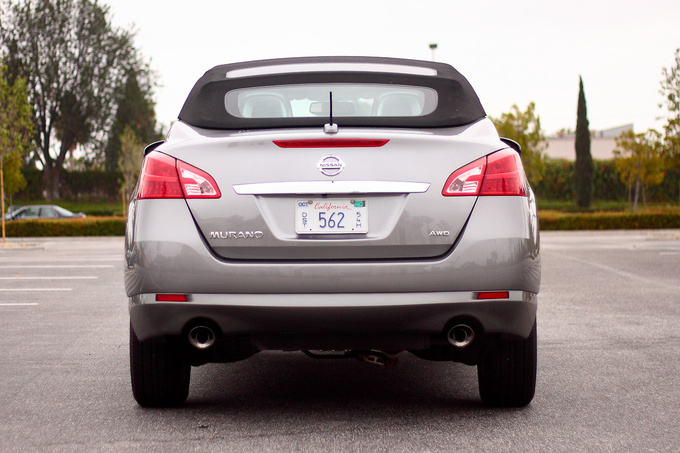 And this is why I'll always have a soft spot for the Murano CC, no matter what the others say.